Cryptococcosis is a systemic disease caused by the fungus Cryptococcus neoformans which predominantly affects immuno-compromised individuals. Cryptococcal osteomyelitis is rare, having an incidence of 5-10% in patients with systemic cryptococcosis. Isolated cryptococcoma of bone is even less common, especially in immuno-competent individuals. 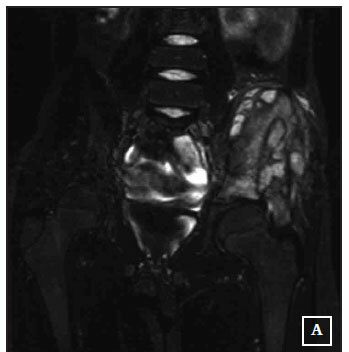 We report a case of a 10-year-old girl who presented with a mass over her left iliac crest. Radiographs showed a lytic lesion of the ilium. Open biopsy and surgical curettage of the lesion was done. Histology showed a cryptococcoma. The patient was treated with fluconazole. After three months of treatment she required a repeat curettage of the lesion due to wound drainage and persistent soft tissue swelling. She continued with oral fluconazole treatment and after 7 months the wound had healed, the soft tissue swelling had resolved and radiographs showed resolution of the lesion. Fungal infections should be included in the differential diagnosis of lytic bone lesions. Tissue diagnosis should be obtained to confirm diagnosis. Fluconazole is an effective treatment for cryptococcal osteomyelitis, with surgical curettage a useful adjunct. Good results can be expected in the majority of cases. Cryptococcosis is a disseminated mycosis caused by Cryptococcus neoformans which is a yeast-like encapsulated fungus.1 The most commonly affected organs are the lungs (pneumonia) and central nervous system (meningitis).2 Most patients infected with systemic cryptococcosis are immuno-compromised. It is the second most common fungal infection in Aids patients.3 Cryptococcus neoformans is commonly found in soil and pigeon faeces. Isolated cryptococcal osteomyelitis is rare.2-4 Bone involvement in patients with systemic disease has an incidence of 5-10%.1,2,4,5 We report a case here of an isolated cryptococcoma of the ilium of an immuno-competent 10-year-old girl. A 10-year-old girl was referred from a secondary level hospital to our oncology department with an abdominal mass in the left iliac fossa. Radiographs revealed a lytic lesion of the iliac bone and she was referred to the orthopaedic unit. 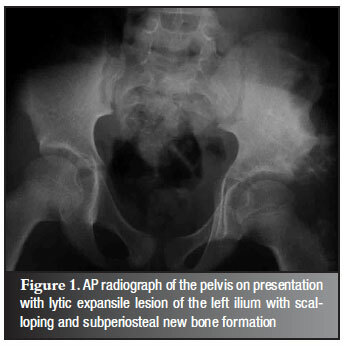 Clinically she had a left iliac crest mass measuring 5 cm × 5 cm, involving the anterior half of the iliac crest. It extended into the left iliac fossa and under the gluteal muscles. It was smooth and firm in consistency, and was mildly tender only on deep palpation. The overlying skin was normal, and there were no signs of local infection. General examination of the child was unremarkable. The mass had been present for approximately 6 months. It was slowly enlarging, and there was minimal associated pain. The child had no history of systemic illnesses and had no constitutional symptoms. She had recently moved to our country with her family from a neighbouring country where they had lived on a maize farm. Pelvic radiographs revealed a large, lytic, expansile lesion of the left ilium with scalloping of the iliac bone and subperiosteal new bone formation and a soft tissue mass outside the ilium. The appearance was that of a benign bone tumour, most likely an aneurysmal bone cyst (Figure 1). Chest radiograph was normal. The full blood count was normal. The ESR was elevated to 99 mm. The HIV test was negative and the Mantoux test was non-reactive. 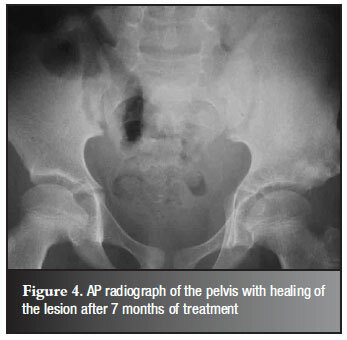 Radionuclide bone scan showed increased blood pool activity in the left iliac bone. 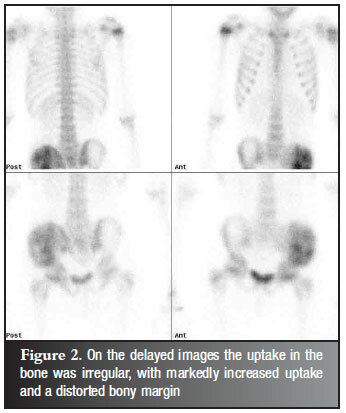 On the delayed images the uptake in the bone was irregular, with markedly increased uptake and distorted bony margins (Figure 2). CT scan was not done. MRI showed an expanded oedematous ilium with multiple cystic areas and a scalloped appearance of the bone. 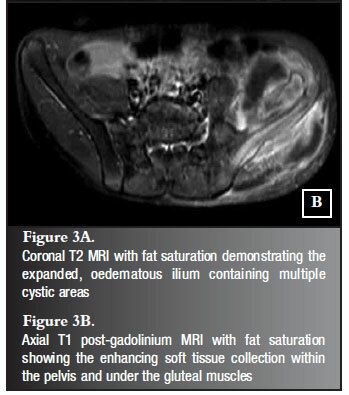 There was a soft tissue mass extending into the pelvis and gluteal muscles which showed inhomogenous enhancement after gadolinium contrast with fat saturation (Figure 3A and B). Although there were no fluid levels the pre-operative differential diagnosis was aneurysmal bone cyst, eosinophilic granuloma and telangiectatic osteosarcoma. Open biopsy of the iliac crest was performed via a utilitarian approach. The apophysis was split and a subperiosteal approach of the inner and outer table of the ilium was done. The lesion consisted of a gelatinous, light brown substance. The iliac bone was expanded into well circumscribed, scalloped areas. The cortex was centrally eroded and the lesion extended through this hole from underneath gluteus medius to underneath iliopsoas. As much of the lesion as possible was removed by curettage. Samples were sent for frozen section histology, general microscopy, culture and sensitivity (MC & S), fungal MC & S, as well as for tuberculosis MC & S.
The frozen section showed features of cryptococcal infection. Paraffin section was performed which confirmed the diagnosis of a cryptococcoma. There were associated giant cells, neutrophils, macrophages and plasma cells seen. PAS stain showed both encapsulated as well as acapsulate forms of Cryptococcus neoformans. The patient was treated with oral fluconazole (200 mg per day). The wound healed postoperatively, but at six-week follow-up there was serous fluid oozing from the wound with mild inflammation of the surrounding skin. The patient was put on a two week course of flucloxacillin. The inflammation improved and the oozing stopped. At three-month follow-up there was again wound oozing with surrounding inflammation. Some soft tissue swelling was still present. The patient then had a repeat curettage. At the time of surgery it was noted that most of the gelatinous material found at the first curettage had not recurred. There was, however a small amount of gelatinous material found in a part of the ilium that had been missed at the first surgery. This was the source of the ooze and it was removed by curettage. Fluconazole was continued and at seven-month follow-up the soft tissue swelling had resolved and the wound had healed. Radiographs confirmed resolution of the lesion (Figure 4) Fluconazole treatment was stopped. The outcome in HIV-negative patients with cryptococcal osteomyelitis is usually favourable.13 Of the 41 patients in the study by Al-Tawfiq with reported outcomes, 37 (90.2%) had been cured and the other four (9.8%) patients had died. The deaths were attributed to liver failure in one patient and to pneumonia in another patient. The other two causes of death were unclear. Cryptococcal osteomyelitis is a rare condition in immuno-competent individuals, but fungal infections should always be considered in the differential diagnosis of a lytic bone lesion. Tissue obtained at biopsy of a suspected tumour should always be sent for routine histology, as well as general, fungal and tuberculosis MC & S. Fluconazole is an effective treatment for cryptococcal osteomyelitis, with surgical curettage a useful adjunct. Good results can be expected in the majority of cases. No benefits of any form have been received from a commercial party related directly or indirectly to the subjectof this article. The content of this article is the sole work of the authors.